The beer choice was very mainstream and adventurous, but I do really like the place with its strange old-fashioned layout and distinct areas. Doesn't feel quite as cosy as other pubs in the area though. One of my regular post work haunts, can get exceptionally busy on a Friday around 4pm onwards. Definitely the best pub in the 'Commercial District' of Liverpool - that's basically the area around Old Hall Street, Tithebarn Street. Nice range of ales which are always well kept, food is very, very good and during warmer months they have a BBQ on Fridays in the yard at the side and offer free burgers. Staff friendly and attentive. Very nice pub indeed. 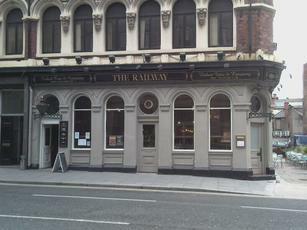 After visiting a couple of pubs with a dearth of luncheon offers we decided to return to our old favourite The Railway. Mr Trotter's was our choice of poison and roast beef and fish and chips to keep the cold out. First class food and service in a friendly atmosphere, what more can you ask for? After visiting the fantastic Battle of the Atlantic Museum around the corner, we decided on lunch at The Railway. We made a perfect choice. A pint of Trooper and a pint of Deuchars washed down Toad-in-the-Hole and a fabulous spicy chicken burger with all the trimmings served by a very friendly gentleman in very hospitable surroundings. What more could two tourists like us ask for? The bill was very modest indeed and the walk through Liverpool to The Dispensary in Renshaw Street was perfect. If you are after good pub grub I heartily recommend the Railway. Despite the carping of some contributors about the lack of unusual ales, I found my choice of Robinson's Trooper perfectly acceptable.We ordered the quaintly named Duck a l'orange which was chalked up on the board. We didn't have to wait long before the waiter presented us with our Duck a i'orange, announced grandiociously in perfect scouse. And,I must say, it wasnt bad at all. Congratulations to the chef! The Railway has everything for everybody ,even tables outside for smokers.